In this renovated, repurposed historic building, you'll find contemporary casual Italian fare, a market and a wine bar. 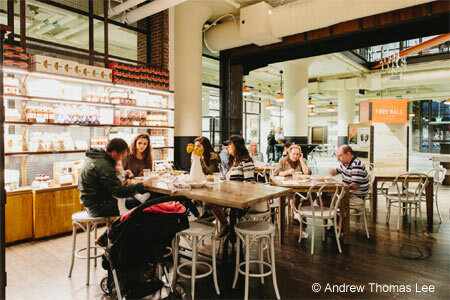 : A project by architect Tal Postelnik Baum, Bellina Alimentari is a unique kitchen, wine bar, market and culinary club in the Central Food Hall of Ponce City Market, formerly a Sears Roebuck store and a branch of Atlanta's City Hall. Designed by Smith Hanes Studio, the 4,000-square-foot space takes its cues from the cafés and small shops of Northern Italy. Artfully arranged conserves and similar high-end Italian comestibles stacked literally to the ceiling provide the visual excitement. Executive chef and Atlanta native Gizzy Barton (protégée of Kevin Rathbun and Linton Hopkins) has taken over from founding executive chef David Berry. The market stocks a diverse assortment of fresh pastas and locally sourced meats and cheeses. Enjoy a plate of cheese and charcuterie from Many Fold Farm, Sweet Grass Dairy and Spotted Trotter. We like the fresh pasta with mushroom cream sauce and the penne with spicy Italian sausage and bitter greens. Top it off with a dessert of Italian antecedent, such as a flourless chocolate torte or panna cotta. The wines are all Italian and may be enjoyed by the half glass, the glass and the bottle.